Finding Species is working to protect Yasuní National Park in the Ecuadorian Amazon, one of the most biodiverse parks in the world. 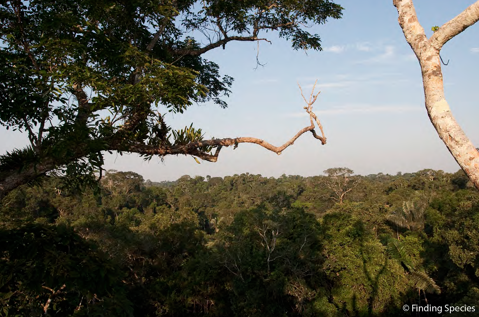 Yasuní is threatened by industrial development, road building projects, population growth and illegal logging and hunting. The main campaign strategies combine public education, media outreach, permanent photographic exhibits, reports produced in collaboration with leading tropical scientists, and meetings with key decision makers. The organization has generated major national and international attention on the issue, and stopped a major oil road from being built at one time. Finding Species donates it's photography towards the cause of educating the public about the beauty and biodiversity of this pristine Amazon rainforest. Bass MS, Finer M., Jenkins, CN, Kreft H, Cisneros-Heredia DF, McCracken SF, Pitman NCA, English PH, Swing K, Villa G, Di Fiore A, Voigt CC, Kunz TH, 2010. Global Conservation Significance of Yasuní National Park, PLoS ONE 5(1): 1–22.